Balanced communication as easy as ABC. Balanced communication is a concept that we developed at the advertising agency SSR in Stockholm 2001-03. The idea behind this is that there needs to be a balance between the external communication and the internal communication. All communication is about creating change. The change can really be anything; a new market position, organisational change, implementing a new strategy etc. A represents the present position and B the wanted position. And the change is from A to B. In order to create the change there need to be a balance between the promises we give to the external world and our peoples ability or will to deliver the promises. Even if your target groups are all internal the same principles apply. 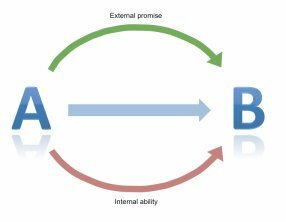 External promises are then external outside your own group. You are always giving promises to groups outside your own. 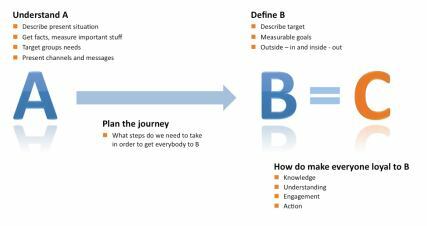 The more your people are committed to deliver the promises the higher the probability that you reach your goals (B). In fact it is crucial. The C stands for Commitment, which will take you to B.